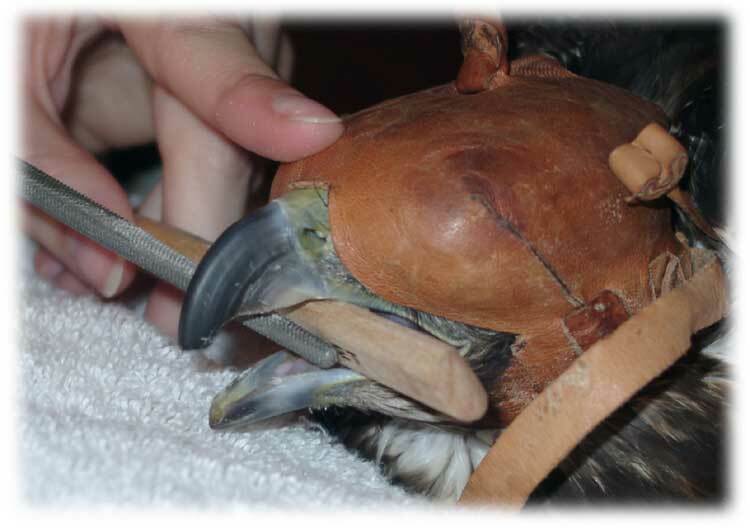 Coping is the act of shaping a bird's beak back to its ideal shape. In the wild many birds cope naturally as they break into bones and work to get meat off of bones. Other wild birds grow unnaturally long beaks which hinder their ability to survive. In captivity we must both provide materials for the bird to work on that will help naturally cope and shape the beak, but we must also maintain the bird's beak ourselves. One tip is to take a picture of your bird the day she is trapped so that you can compare her natural beak and talon shapes over time. The shape they are in when you trap may not be optimal and you may need to address even a newly trapped bird, but having them as reference points never hurts. This bird is in need of coping to shape both the tip and the underside of the top mandible. The red lines show roughly where the shaping needs to happen. One problem here is that if this phalange from the upper mandible is not shaped up, it will develop a crack where the arrow is. 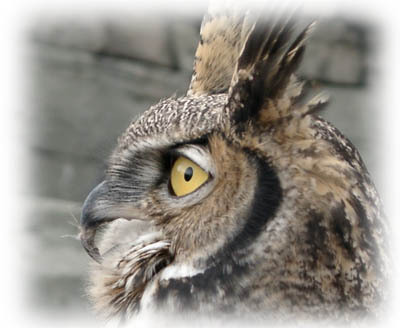 This Great Horned Owl has an extremely long hook on her beak and needs to be coped. Less obvious in this picture is the cruft on the outside of the beak. It should be cleaned up to allow it to function better, and stay clean. One word of advice is to beware of Dremels and other similar electric equipment. I have watched masters use them and shape a bird's beak beautifully, but they are easy to make mistakes with - mistakes which result in injury, deformity, and much blood. They also heat up the tissue very quickly causing pain and damage. If you are not an expert at the handling, coping, and shaping, stick with the manual equipment. I frequently use a Dremel as part of my coping, but have also practiced and always use caution. I have experimented with a Dremel on my own nail so I am aware of how this feels to her. I stop frequently to determine if there is any heat build up and check the shaping progress. I highly endorse Dremels to be used, but as with any of the equipment, always with caution. One husband - for holding the bird and helping. Doing this by yourself can end up injuring you or the hawk. It is possible to use other restraints, but two people is preferred. Sharp trimmers - A pair that is convex will work better than concave toe-nail trimmers, but a sharp pair of good dog nail trimmers will also work very well. Some oil - Sweet Almond Oil is a good choice for oils as it is light, has a small molecular size that penetrates surfaces well, and is high in Vitamin E.
The free handler will now assess the situation and determine where to start. 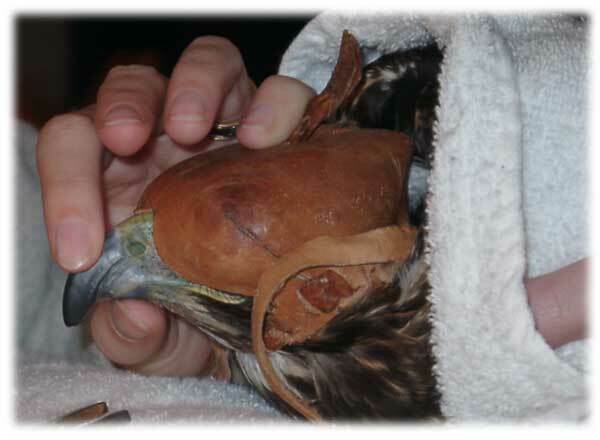 With one finger on top of the beak and the thumb below, assess the beak. Be careful not to cover the nares! 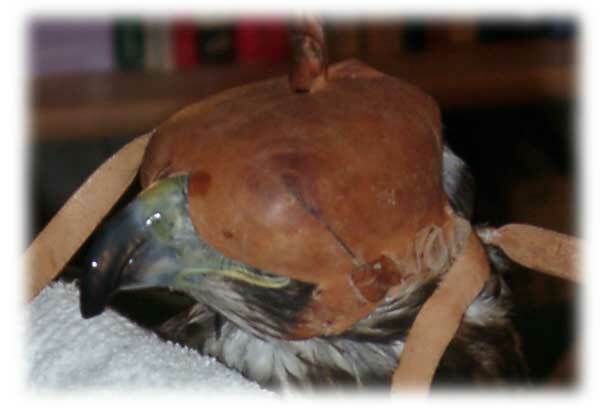 Also take care not to shove the hood into the bird's soft skin around the cere. Like trimming a dog or cat's nails, there is a quick in the beak. 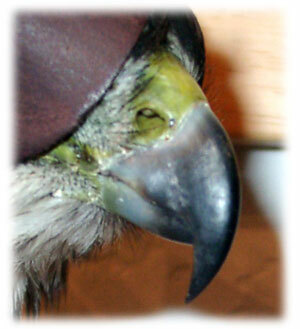 An overgrown beak may not be able to be brought fully back into shape in one session. If the beak is terribly overgrown, start to shape it some, then do another shaping session in a week or two to let that quick rise further. Usually the tip is a good place to start. Some falconers take great care to shape it well. Others give it a rough shape and allow the bird's normal usage to finish it off. Either way works. Nipping the tip with a pair of very sharp dog nail trimmers will get the job done. When using toenail clippers or another clipper to shape the beak, always clip to reshape holding the clipper edge parallel to the edge you are clipping - don't try to take off length unless it's necessary. Think of this as reshaping to a smaller shape. As you clip you will hear a dry, sharp "click" or "snap". When it starts to sound rubbery, stop clipping. Be careful using a clipper on any area which is thin and could crack. Some very dry areas may need several treatments with an oil or salve in order to moisturize them enough to start to shape them. Other shaping may be necessary. For birds which have roughness or slight deformities in the beak, additional contouring may be needed to prevent cracks from forming. Taking a dull razor blade and dragging it along the surface of the beak from the cere area towards the tip will slowly shape the surface and smooth it. To address the sides, you will need to open her beak. One way to do this is to use a wooden pencil or wooden spoon (depending on the size of the bird). With the edge of the wood, tickle the hair-like feathers to the side of her beak. She will likely open her beak to bite whatever is there. While the beak is open slide the wooden handle into her beak to prop it open. Now you can carefully work a file to slowly shape the beak. Beware to not hit the bottom mandible, the tongue, or the other side of her beak. Also take care not to jam the wooden wedge against the corners of her mouth as that would not be comfortable. File a bit, then feel the area to make sure that there is no heat being generated, then file some more. Use a wooden spoon handle or similar implement to hold the mouth open to allow you to file the beak. Take care not to hit the lower mandible when filing the upper mandible and vice versa. Repeat this on the other side of the beak to properly shape the entire beak. Check the cere for any signs of abrasion from the hood. Once you are certain that the beak is in good shape, take a few drops of oil onto your fingertips and rub them into the beak well. This will help rehydrate the beak and keep it supple preventing cracks. A freshly coped bird with an oiled beak. For a bird with a particularly dry beak, you may want to oil it several times a day before coping, then continue oiling it on a regular basis. Birds with a low fat diet are particularly susceptible to having a dry, flaky beak. With this done, the handler should grab her meal (a warm hunk of quail or rabbit leg) and put the glove back on. Put the meat into your fist in preparation for the bird and place your fist in her talons if at all possible. The towel handler can now, basically, just let go and remove the towel in one swift motion. The bird may lay there or may jump to her feet. If she jumps, the glove handler should be prepared to help her regain the glove. If she lays there, just let her work through the situation and let her regain the glove when she is ready. Once she is standing on the glove and calm, strike the hood and let her see her fine meal there. Many falconers believe that all is forgotten when the meal is given. The bird is likely not encountering the difficulty of tearing flesh in captivity that she faced in the wild. Because of this she must also have some opportunities to tear into flesh and bone to naturally shape her beak. Giving her large bones with a small amount of meat attached works well to keep her working on the bone wearing down the beak. Some falconers use large venison or beef bones - large enough that she will work on them without being able to ingest them. Turkey backs are another good source of solid bone that they cannot ingest. Other falconers take care to feed their birds the whole heads of the rabbits that are caught. Some birds may not need more than this, but others may need constant attention. Pay attention to the condition of your bird's beak and the needs - is it too dry and flaky and in need of moisture, or is it growing rapidly, and then address the situation accordingly for the optimal health of your bird. Some birds will be trapped with bad beaks, either overgrown or with a tendency to grow poorly. These will require special maintenance. For long beaks, do not try to take off the length with a dog nail trimmer. The act of closing the trimmer around that length of the beak tip will have the effect of crushing the tip and cause cracks up the beak. Slowly correct the beak length and shape. Take a whole turkey neck, remove the flaps of meat from it, and give it to the bird a week before coping. Leave her with it for several hours so she has had a chance to really work at the tendons and the bone. She will naturally alter the shape of her beak some in doing this. If she leaves meat still on the bone, collect the bone, rinse the length of it off well, and refrigerate until the next day allowing her a second chance to work that same segment of bones. Giving her the bone well in advance of the coping allows her quick to recede somewhat prior to your coping her. Begin by moisturizing the beak, especially the tip, by rubbing some Sweet Almond Oil into it several times a day for several days before coping. 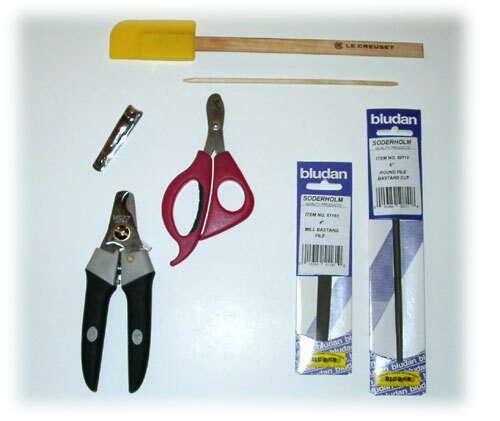 To cope, you will need a sharp cutting instrument like the cutting tool available in the Northwoods' coping kit. Use the tip to scratch the desired length shape on the beak tip. Start slowly and use the tip to continue scoring the surface of the beak - you will basically gnaw a groove into one side of the beak. Change and go to the other side. 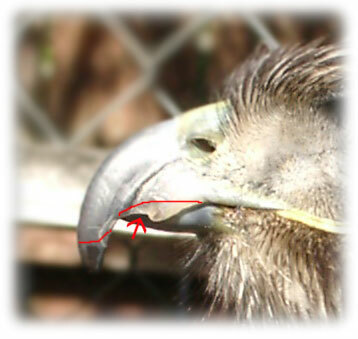 The two scoring lines should begin to meet towards the most front facing area of the beak. You can now start scoring from the front, then continue rotating through each side until you have removed a section of the length. Never try to fit the beak tip into the jaws of the cutting device as you will have the effect of crushing the beak material and cause cracks up the beak. The sharp tool will quickly make a groove in the beak and it doesn't take that much work. Moisturize the beak well and reward the bird with her meal. For her next meal, repeat the turkey neck to allow the beak to come back into its fully functional form. You will want to occasionally give a turkey neck in this manner to a bird who is particularly difficult to keep a good beak on.